The San Francisco-based startup also lands a new garage smart-lighting project and looks for more office space. Networked “smart” lighting startup Adura Technologies has landed an $8.5 million Series B round from investors to push its wireless controllers into more and more lighting fixtures across the country, starting in its hometown California Bay Area region. Investors included NGEN Partners, VantagePoint Capital Partners and Claremont Creek Ventures. Adura, founded in 2005, has previously raised $17 million, bringing its total haul to about $25.5 million. The San Francisco-based startup also announced a new customer, Oakland’s Kaiser Center. The 28-story office building has a 1,339-stall parking garage with fluorescent lighting, where Adura has installed its Wireless Lighting Control System -- a wireless box on every light fixture, networked to a central platform. Adura says it can shave 40 percent to 70 percent of the garage’s lighting power bill, simply by dimming lights in daylit or unoccupied portions of the garage and other such tricks. 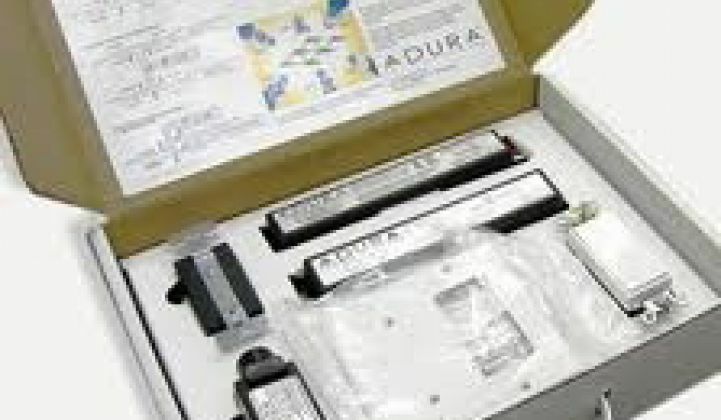 The Kaiser project is one of 25 installations totaling more than two million square feet that Adura deployed in the first quarter of this year, bringing a total of 6.5 million square feet under Adura's networked lights, according to a Thursday announcement. This makes Adura a big player in the still-small world of smart lighting. Only about 7 percent of today’s buildings network their lights for energy savings today. But lights consume about a quarter to a third of a typical commercial building's power bill. Technologies that can provide an initial 40-percent to 50-percent efficiency gain and maintain it over time, as Adura and competitors say they can do, could find a lot of interest. One noteworthy player, Daintree Networks, announced a partnership with lighting giant Sylvania’s services arm this month, with a 340,000-square-foot deployment with their first, unannounced, customer. Daintree differentiates itself in that it uses ZigBee-compliant technology, unlike competitors like Adura that use proprietary tech in one or more layers of the OSI stack. Other competitors include Enlighted, which networks sensors to offer distributed intelligence at the individual light fixture level, Digital Lumens, which networks LED lights for warehouses, and Redwood Systems, which wants to network and power LEDs over Ethernet cables. While we’ve yet to see giants like Siemens, Schneider Electric, GE, Honeywell or Johnson Controls use their incumbent building management system positions to colonize networked lighting, that could change. Beyond the choice of networking and control architectures, of course, it’s up to the software behind the platform to measure, analyze and control those lights to actually save energy without messing with the building’s operations. Early deployments are being closely watched to ensure that the technology actually saves money and delivers ongoing value as promised. Adura’s software can also analyze data from previous deployments and adjust controls to achieve greater effects -- a sort of machine-learning process that’s integral to many of today’s new building energy efficiency software technologies, including startups like Viridity Energy, SCIEnergy and BuildingIQ. Adding occupancy, temperature, humidity and daylight sensors to light fixtures allows even more fine-tuned control. Adura is growing: the company said 2011 revenues were up 273 percent over the previous year, though it didn’t provide any concrete figures. So far it has mostly done parking garages, though it is also expanding a garage project with Hills Plaza in San Francisco by moving up into office suites. There it has been able to cut power use in half via such methods as dimming lights during daylight hours and shutting them off in unused hallways and conference rooms. CEO Mark Golan told me in an interview late last year that office space is a big target for the startup in 2012. While the vast cubicle wasteland may be the biggest target market for smart lighting, warehouses, grocery stores, outdoor parking lots, streetlights and many other classes of lighting are also open for greening. Stay tuned for a lot of action in this space, which is also at the nexus of the push for LED lighting in the commercial sector.